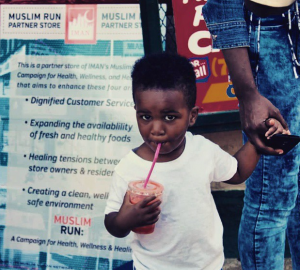 Each Ramadan, IMAN organizes the Refresh the ‘Hood Challenge at select Muslim Run corner stores. Refresh the ‘Hood is a collaboration between M.U.R.A.L (formerly the Lupe Fiasco Foundation) and IMAN, which supplies corner stores with subsidized produce to sell at a discounted rate. Four stores received a weekly supply of fresh fruits and vegetables. Throughout the month, IMAN leaders engaged residents through basic wellness outreach and education at the corner stores. Free fresh fruit smoothies were provided by our partners at Al Bawadi Grill. 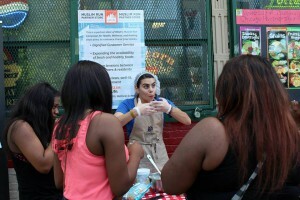 This year, IMAN deepened the Refresh the ‘Hood effort with cooking demonstrations and by installing new display baskets for affordable produce in the corner stores. Nutritionists from UIC’s Chicago Partnership for Health Promotion demonstrated simple recipes only using ingredients found inside the corner stores, while educating attendees about the health benefits of those foods. Refresh the ‘Hood continues to serve as a powerful example of the impact health and wellness education can have at corner stores. Thanks to our cosponsor, M.U.R.A.L. ; our partners at UIC, Al Bawadi Grill and EverThrive Illinois; and the many IMAN leaders who all helped make this year’s Refresh the ‘Hood Challenge a success.